Social Media: Does it complement or detract from life? Social media is key part of all of our lives and everyday it seems that something happens to reinforce its impact on our lives. It is estimated that the average person in america spends upwards on 37 minutes per day social networking and that 46% of web users are influenced by social media when making a purchase (https://www.marketingtechblog.com/2014-statistics-trends-businesses-social-media/). During the social media boom around 2006 the younger generation (18-30) were by far the quickest to adopt the technology; but recently the largest growth has been seen amongst 45-50 year olds. I think its impressive how older generations are adopting the technology and making use of it in ways that I wouldn’t have even imagined. Personally, what I find most interesting is that as older generations come on board it seems that the technology is being used more as an extension of social activity that is already taking place offline. One of the most vibrant Facebook groups that I am a member of is the `Consett and District Heritage Initiative. Consett has always had a large number of individuals interested in local history and groups such as this are extending activities that already take place offline to allow a greater number of people to get involved with the conversations and really bring history to life. With social media being used in this way I wonder if critics ever had anything to be worried about when arguing that online social interaction was going to have a negative impact on real life social interaction. I find that my online life compliments and enhances my actual life and far from becoming more of a recluse it actually causes me to interact with a much greater range of people some of whom I would otherwise not have the opportunity to interact with. Whats your experience of social media? Does it enhance or detract from your “real life”? At Footsqueek we have recently been doing a lot of work with QR Codes. We are using them as an educational tool to allow schools to make wall displays much more interactive. A couple of years ago QR codes seems to be everywhere, on every high street, on business cards, in shop windows, and on membership cards to name but a few. Recently they seem to have been less prevalent and i’m wondering why that is – has the technology been and gone so quickly? Perhaps people are looking for technologies to make their lives easier – having to reach into your pocket to get your phone to scan something seems easy enough but maybe its viewed as to much effort or to consuming to really make life easier. After all do we really need to see the content that is linked to from the QR code. I still speak to countless individuals who have no idea what a QR code is or how to use one – on that basis maybe the technology piqued before its time. That said we still find it useful in an educational context so maybe there are some specific markets – are you using QR codes? How do you use them? Artificial Intelligence – Can a Robot Ever Be Intelligent? 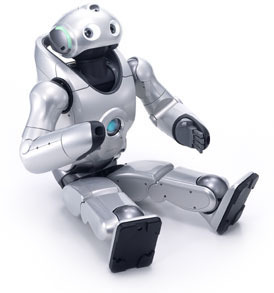 I was recently reminded of of a Robot developed by Sony a few years ago called QRIO (Quest for Curiosity). The device had some awesome unique features like the ability to recognise people’s faces and the ability to deal with emotional responses such as anger or annoyance. One of the most amazing things about the machine is that it has the ability learn. It occurs to me though that as intelligent as QRIO may seem, and despite the fact that it can copy and remember behaviour the robot is not truly intelligent because it doesn’t have the ability to make independent decisions – it simply does what it is programmed to do. We must therefore consider what we really mean when referring to an intelligent technology and question if technology can ever be truly intelligent. There is only one condition in which we can imagine managers not needing subordinates, and masters not needing slaves. This would be if every machine could work by itself, at the word of command or by intelligent anticipation. It is possible for programmes to be written that can emulate intelligent anticipation. An example would be a Central Heating system that can be programmed to maintain a certain temperature within a set environment. The system anticipates when the consumer is likely to want to turn the heating on, responds to the environmental change and performs the task. This is not, however, true intelligent anticipation because the system only reacts when a set of pre-programmed conditions are evaluated as true. To be intelligent the system would have to decide what the required temperature was without any human intervention. It occurs to me that even if such a system were technically possible consumers would react negatively as the concept comes close to the Big Brother totalitarian state described by Orwell in his Novel Nineteen Eighty Four. Darwin’s theory of Evolution demonstrates that the human race has evolved into an intelligent species, embracing inteligence to survive; it could be argued that truly inteligent systems are the next stage of human evolution and could be used as a self protection mechanism to assist our survival. Until technology enables this evolutionary shift we much resign ourselves to devising methods of control for automated systems that make working with technology more convenient for the consumer, while recognising that sometimes a task does not require automation because the consumer is content with the current solution, or because society is not yet ready to embrace the long term possibilities or consequences. As we wave goodbye to 2014 and look forward to 2015 I find it fascinating to review how technology has changed and evolved society throughout the year and speculate what the future may hold. So heres 5 things to remember about 2014 and a few predictions for 2015. 1. 2014 was the year of the big social crazes! Who didn’t neck nominate? and I can’t believe anyone avoided the Ice Bucket Challenge? If you’re interested heres mine! 2. Data security and privacy has been right at the forefront of our newsfeed. The year started with 4.6 million snapchat accounts being compromised, followed in April by the target heart bleed fiasco which exposed the payment details of 40 million target customers. In September 5 million gmail passwords were released on a Russian bit coin forum. 145 million accounts were stolen from eBay in May; several celebrities learnt why they need to have good iCloud passwords and most recently Kim Jong Un and North Korea hacked Sony Pictures in an attempt to prevent the release of The Interview. if there’s one thing to be learnt by all of this it is that data is still not secure online and companies have a long way to go to ensure that our data is protected. 3. The CIA joined Twitter in June – but they can neither confirm or deny that this is the case. 4. In September Apple launched the latest iPhone(s). The iPhone 6 and iPhone 6 plus are the most advanced handsets ever – in my view the most exciting feature is the introduction of Apple Pay which allows consumers to pay for goods using their phone instead of their credit card. This isn’t available in the UK yet but I really think it has the potential to change the way we pay for goods and services forever! They also launched Apple Watch – personally i’m not convinced about this one yet but i’ll let you know when I buy one in 2015. 5. Talking of Apple Watch wearable technology seems to have had some big hits this year! Google Glass was launched as a premium product in the uk; keeping fit with fit bit, Nike Fuel Band and other similar products seems to have suddenly become cool. I bought myself a Pebble smart watch (and so did at least two other people I know) – I know hardly makes it main stream but you had to at least consider that some of this stuff is catching on! Maybe 2015 is the year of the wearable. So thats a brief look at what has caught my attention during 2014 – any thoughts on the 2015 trend? I’ve recently started having golf lessons and I’m really enjoying it! I’ve been really surprised by how quickly I’m learning the sport and how quickly I’ve been able to see visible improvement. As a result I’m spending more time at the golf coarse; something which is taking a little getting used to is the quirks of golf etiquette – “no trainers in the club house”, “no mobile phones on the fairway”. No one tells you these rules unless you break then – hence the fact that I’m now eating breakfast outside in my trainers – in fairness it’s warm enough but it has made me consider whether sometimes rules for the sake of rules becomes annoying.